Jenn Lamb of Unurth in her headshot from Get Lucky Live. Q: Introduce yourself and what you make and how long you've been doing it. Hello! My name is Jenn Lamb. I am the maker + designer behind Unurth. I create modern, organic, cheerful ceramics inspired from nature. My aim is to bring a little bit of the outside in + create objects that slow us down in our daily rituals. Unurth was born in 2012. It has been an amazing journey so far and I am so excited for what the future holds! Q: How did you hear about Get Lucky Live? Lucky Break Consulting + Lela Barker crossed my path last year via twitter and I was immediately impressed with her insightful teachings for small biz. She is to the point + full of wisdom. I joined her forces part time and have been helping behind the scenes. Get Lucky Live was born from a desire to connect with makers in person. We wanted to roll out the red carpet to help our participants level-up! This is great for small business makers looking to learn a lot in a really short period of time. Specifically this will resonate with folks who have the building blocks of a strong brand and are looking to start wholesaling right away. If you haven't wholesaled yet and are looking to dig in this would be perfect! 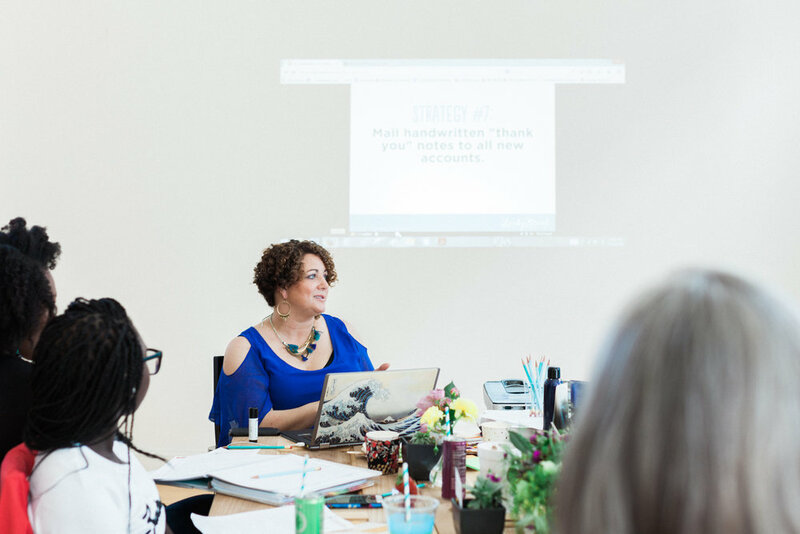 Participants got a major boost in their wholesale game with workshops on getting great press, wholesale fundamentals, product pricing, keeping stockists happy, photo styling, and social media. It is amazing the info they get. Q: What was the conference like? Get Lucky Live was so much fun, redefining "work" to mean "work party." Held in Atlanta at The Seed Studio in September, no detail was left out! The event was styled beautifully and the food was delicious. Second, and so important was the intimacy of the setting. This is a small group workshop intensive. People are able to ask questions and connect with each other. The feedback was individually tailored and everyone was able to talk about the challenges in their own business. The coolest thing is while the workshops were happening, we worked on line sheets, order forms, head shots, styled editorial photos of their products and combined with the product photography taken in advance of the event, they left with a TON of tools that they could immediately utilize. My favorite part had to be the Q + A with a buyer. Jessie of Young Blood Boutique (a gorgeous shop in the Atlanta area!) joined us to answer questions. It was incredibly valuable hearing from her directly and getting to ask questions. Best advice- Keep your lead times down, your collections concise + complete, and be friendly + to the point in your interactions. Oh and social media is MAJOR. This is how she found the majority of her vendors! A: You can find me online at www.unurthhome.com + on instagram @unurthwonder. Ill be at a few local shows (Renegade SF, Unique LA, Renegade LA), come say hi! A: Best of luck this season everyone!